Reebok Legacy Lifter was released in 2016. The shoe is considered as one of the best weightlifting shoes by many gym goers. The shoe looks great. Many weightlifters acknowledge it for its weightlifting specific abilities and functionalities. I have posted an article of the best 5 weightlifting shoes. Reebok Legacy Lifter is in the list. I’m writing this article to provide more information. If you want to see the best 5 weightlifting shoes I have selected, go to 5 Best Weightlifting Shoes for Men. Few customers have provided some photos on Reebok site showing how they are wearing Reebok Legacy Lifter during training. I have obtained few of them from Reebok to give you the visual images of wearers during performance. I’ve gone through a high number of customer reviews, not only on this colourway but also on the Reebok Legacy lifter shoes in general. The following are what people think. After spending some hours reading customer reviews and watching some expert review videos, I’ve decided to come up with the following information to provide some helpful data. During my research, I obtained some data from Reebok to provide some helpful and useful information. As at the time of this review, 97% of reviewers recommend the shoe. The reviewers rate it 4.7 out of 5 star. For additional information, I’ve created a pie chart which should give you some data regarding what people think of the shoe. After some hours of research, and based on what reviewers have said, I have come up with some negative and positive aspects of the shoe which I would like to highlight below. I used different sources including videos, some other reviewers articles, sellers and Reebok site during my research. If you are a weightlifter and have used the shoe before, you may disagree or agree with these points. The upper Velcro Straps ensure secure lock down. I have to say this can prevent the risk of any injury. In weightlifting, you do want your feet to be secured and stabled one the ground. The velcro straps are designed to provide such support. Before I conclude, I will like to add a quick video review. The guy in the video talks about the various parts of the shoe. He highlights some of the pros and cons. Hope it will be helpful in any way. The shoe has gained popularity after its released in 2016. It’s one of the best weightlifting shoes you could find out there. The shoe is applauded by many weightlifters for its weightlifting specific functionalities. 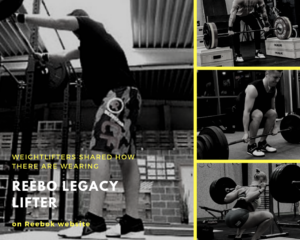 There are many professional weightlifters that feel a big difference in their squats and power lifts when they wear the Reebok Legacy Lifter. Though the shoe is considered the best among weightlifters, it’s not the favourite shoe when it comes to versatile gym activities. If you’re going to gym with the shoe and thinking of doing some training that will require quick and easy movement, you may want to find another pair of shoes that’s not specifically made for weightlifting. If you still like to know more about the shoe, you may continue reading. I’m going to provide some information one the upper, midsole and outsole. First of all, I have to say whenever you see perforations in a shoe, just like the ones on the toe box area, you should know that they are not just there for decoration but to allow adequate ventilation. 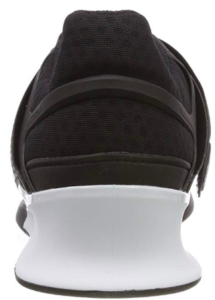 The two lightweight velcro straps provide enhanced lateral support. The first strap can be seen just above the toe box area and the second strap is located above the first strap. Both straps are adjustable and they provide secure feel and fit. The exoframe technology in the heel (Thermoplastic polyurethane strap) offers more support and steadiness during training. Almost 75% of the upper is leather. The mesh in the ankle area provides additional comfort and breathability. Reebok Legacy Lifter has a removable insole. So depending on what you want, you can either leave the insole alone or remove it. Anyway, the insole is there to provide arch support to enable more secure fit and comfortable feel. The inside has Ortholite antimicrobial ( agent that kills microorganisms or stop their growths) sockliner. This helps to keep the inner part free of some bacterial build-up. The heel section of the midsole features hard thermoplastic polyurethane (TPU) material. This is not a compressible material – the section do not have any cushioning. So wearers feel steady and supported during training. Reebok Legacy Lifter features rubber outsole. The flat and wide footprint design creates a stable base. The overall outsole design offers excellent durable and grippy platform. It enables the shoe to lay flat and stable on the ground while weightlifting. First of all, thank you for sharing this and for doing the great research! Have been looking for a weightlifting shoe for some time now, in particular, one for squats and deadlift as those lifts are the ones I feel I need extra shoe support in, as the injury risk (at least for me) is the biggest on those lifts. Thanks again for this great research and presentation! Thanks for your question reading this article. Long legged you mean? If that’s yes, I don’t know which shoe to recommend at the moment. Here is a thing, I will do some research and send you an email. Hope that’s alright with you. As I promised, I’ve done some digging regarding your question. Apparently, it is necessary to get a weightlifting shoe, especially the one with heel like the Legacy Lifter. As I already mentioned in the post, it enables your knee to go forward more, thereby easing your lifting. I would definitely recommend the Reebok Legacy Lifter for you. Some of the weightlifting shoes my source recommends are Adidas Adipower, Adidas Powerlift, Nike Romaleo, and Do-Win. I chose some of those shoe as my best 5 weightlifting shoes in my previous post. Reebok legacy is a good shoe for weight lifting. It’s just that it’s only for a specific purpose in the gym and one can not weight lift and still perform other gym activities with Reebok at the same time. You will need to change your shoes because Reebok wouldn’t let you do some certain kind of training because you won’t find it comfortable doing some kinda training with it. anyway I like the shoe. I like the antimicrobial properties inside the insole. I am in the process of looking for some real solid shoes and I’m so glad i found this post. There are so many options out there and this looks like a solid option for me. I need something that is durable and working for my flat feet. This definitely looks like the shoe for me! This shoe sounds like the perfect shoe for weightlifting. In spite of the cons of the shoe, for the serious weightlifter or person who is engaged in that type of weight-training, the shoe looks like it is perfect for supporting the lifter as they work with the weights they lift. The heel looks perfect for supporting this type of workout! I will be looking at these shoes further for my grandson who is just getting into weightlifting. Anything that can help him so he keeps pain and injury free is a great asset! Thank you for your review! I wish I can give exact break-in period. What I can say is, it depends on how often you use the shoe. Another things is not everybody complain about break-in period so it may fit perfectly the first time you put it on. The fact is you will need some times to get used to the weight. Yeah, you may try and use it for other purpose when you are used to it. Thank you for a very comprehensive review of the Reebok Legacy Lifter shoes.I am attracted to these shoes because of their appearance and professional design.However, I need shoes for general gym use and some of the features such as elevated heel and rubber outsole would appear to be negative factors.Then there is the price.I would like to see your comparison of this shoe with the Nike gym shoes in terms of value. That is considering both price and performance ,for a general gym use, which one is the best value in your opinion.Thank You. If you want a shoe that you can use for general gym use, I will not recommend the Legacy Lifter. For a person that has more interest in weightlifting and want a shoe for that I will definitely recommend the Legacy lifter, Adidas Adipower or Adidas Powerlift 3.1. Other than that, you can go for the Nike gym shoes as they are versatile and seem to function well in the area of your training. Many fashionable women have said that shoes make the outfit, but with all kidding aside, shoes may be the one thing that contribute the most to the medal. Footing and balance can never be over emphasized. Thank you for including the Rebox Legacy. Although each lifter has his and her own preferences The legacy makes the mark covers all my needs. Thank you for this review of Reebok Legacy Lifter. One of my husband’s buddies is a weightlifter and his birthday is coming up next month. My husband has no idea what to give so he asked me to find something that his friend might be thrilled tor receive. I believe that comfort is one of the top things one considers when buying shoes, and Reebok Legacy Lifter has it. It does not matter whether you’re an athlete or are working in a cubicle. I wouldn’t want to wear shoes that are not comfortable. Because if that’s the case, I’d rather be on my slip ons. You said that it is a bit too heavy for training but I don’t mind. That’s because it was really designed for weightlifting. Anyway, I’m gonna show this to my husband for his approval, thanks again. By the way, are the sizes the same as regular training shoes? You can find the shoe in the range of size 6 to 14. I also have to say most reviewers say the shoe fits true to size. So, there is a big chance that going for his normal shoe size will be alright. I returned to your website to find a review on Sketchers, but I found none so far. I saw Reebok and since I wore this brand for years following an injury, I felt I needed to check this out. Reebok generally gives excellent support and so I see no reasons why this one would be different. I absolutely love the removable insole idea too. Not to mention the elevated heels. Without these my days are painful. Is it possible for you to do some Sketchers review? I’ve been thinking of some cool shoes to review. It’s good you mentioned the sketchers. I will definitely do it. In the meantime, please let me know if you have a specific sketchers sneaker you would like me to review.